Why do people invest their money rather than just save? It’s not just about growing your savings so that you will have more money in the future. It’s about growing the buying power of your money. You want the £1 that you are investing today to buy more things in the future than it does now. To achieve this, the money that you invest has to grow at a faster rate than the price of things that you want to buy (more commonly known as the rate of inflation). So how do you grow the value of your savings pot more than inflation? Receiving income – interest from savings accounts and bonds, rents from property and dividends from shares – and reinvesting it (compound interest). An increase in the value of the asset (e.g. the share price) – driven by how much people are prepared to pay for the stream of income coming from it. Compound interest is essentially earning interest on the interest that you’ve already been paid. You can use this strategy to very good effect with dividend paying shares. Instead of spending the dividend you receive, you use it to buy more shares in the company which paid you it, which in turn gives you more dividends in the years ahead. Repeat this process for long enough – the longer the better – and it is possible to turn a small initial sum of money into a large one. This can be the case even if dividends per share or the share price do not change. Savings accounts are slightly different to other investments. They only grow from reinvesting the interest income received and compounding that over as long a time as possible. Unlike other investments, you can’t make money by selling your savings account balance for more than what’s been invested in it. In recent years low interest rates on savings accounts have meant that money invested in savings accounts hasn’t been growing more than inflation – it has been losing money in real terms, it buys less. This has pushed people into different investments – such as bonds, property and shares – in the attempt to make more money. The income from an investment divided by its current value or selling price is known as its yield. Think of the yield as the interest rate on an investment just as you would a savings account. The yields on bonds, property and shares have been higher than savings accounts which has led to more people buying them which has pushed up their price. Why does this happen? The price of most income-producing investments is related to their interest rate and how they compare with interest rates on savings accounts. The best way to think of this is to imagine a seesaw. When one end is up, the other one is down. So when bank interest rates fall, the price of other investments tends to go up as people looking for a higher interest rate buy them. When interest rates go up, the price of bonds, property and shares tend to fall as savings accounts become more attractive (because of the combination of reasonable yield and lower risk). As a general rule of thumb, the higher the interest rate on an investment, the higher the risk for the investor. That’s because they have to be tempted with a higher interest rate to compensate them for the risk of losing money. Savings accounts can offer low interest rates because they are relatively safe (up to £85,000 is protected if the bank or building society goes bust). Savings accounts also don’t fall in price if interest rates go up. Bonds, property and shares may offer higher returns and help you grow the value of your savings but they are more risky as the value of them can go down as well as up. I’m not going to get into the subject of risk here, but it’s safe to say that you should spread your money around different types of investment to spread your risks. If you don’t like risk then you generally have to accept that you will get a lower return on your money by investing mainly in savings accounts and bonds. If you want more risk and the prospect of a higher return then own more property and shares. Property and shares can offer you higher returns because they can grow their income streams over time as rents and profits increase. Bonds and savings account tend to offer the same interest rate for their entire life (that’s why they are known as fixed income assets). More of us have become buy-to-let property investors over the last twenty years, but investing in property is not easy, requires large amounts of money and can be difficult and expensive to buy and sell. That’s why lots of people prefer to put their money in shares which can be bought and sold quickly and cheaply from the comfort of your living room or wherever you may be. SharePad has been designed to help you with this. Investors, however, can easily invest in property, bonds, and other assets like gold, using investment funds – like the ones promoted by most ISA and SIPP brokers. There are other types of fund as well – investment trusts and exchange traded funds (ETFs) all available via your broker. 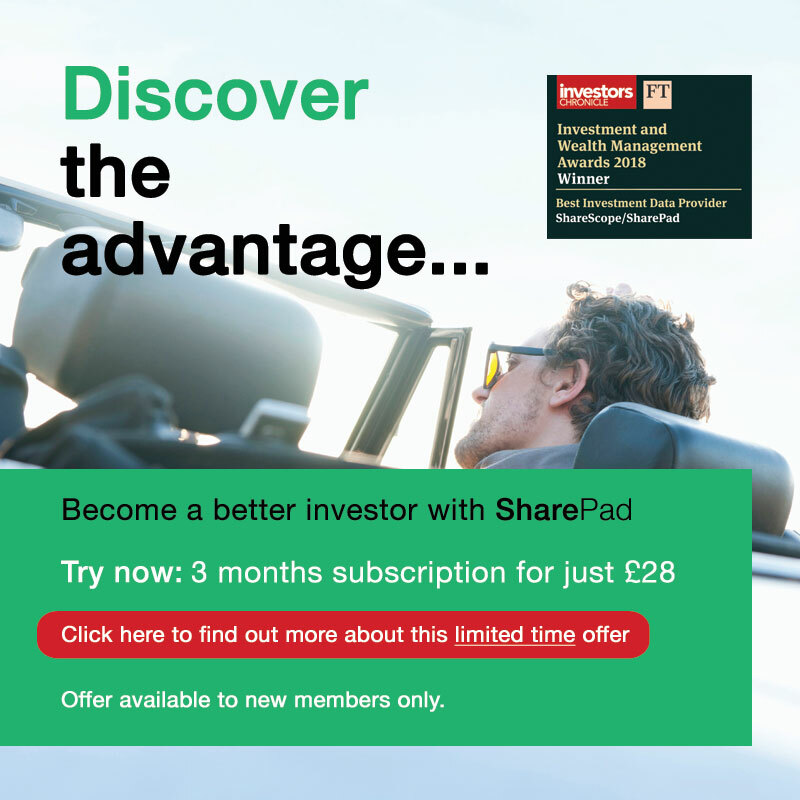 SharePad helps you choose the best value funds as well. Most investors are advised to build a diversified (or balanced) portfolio containing shares and funds for exposure to other asset classes. So, which shares should you buy? Crucially, investors should look to buy shares when they are undervalued. As consumers, we tend to pay more for products whose quality we can rely on but these products often command premium prices due to their brand reputation (think Apple). So most of us look out for sales in which we can get these products at a decent discount. To make money from the stock market you should apply the same reasoning to buying shares. What you’ll tend to find is that investors pay more for shares or funds which seem to offer a better prospect of higher returns. Once the market in general notices how attractive a particular share is, the price gets pushed up to expensive levels. However, share prices also move up and down a lot. Investors are well known for over-reacting to both good and bad news. Consequently, individual shares tend to fluctuate between periods when they are overvalued (expensive) and undervalued (cheap). Smart investors look for great quality investments trading at cheap or, even better, bargain prices – like buying an iPhone for half its normal selling price. Unfortunately, many private investors are well known for getting this wrong. If a company’s share price shoots up, many private investors think “this must be a good company” and invest. At the same time, smarter professional investors think “this share has got expensive and will probably need to cool off”. They sell. Because professional investors own large blocks of shares, the price falls and private investors then lose money by panicking – thinking they will lose lots of money – and sell their shares. In some cases, where the prospects for the company have deteriorated significantly, selling may be the right course of action. However, often the sell-off is an over-reaction or simply due to a bad period for the broader market. In this case, smart investors think “this is a great chance to buy these shares cheaply”. They buy and the price eventually goes back up. As the maxim goes: private investors buy when the price is high and sell when the price low. Good investors do exactly the opposite. Let’s be clear, though. Many private investors are flying blind. They do not understand investing sufficiently and they do not have tools like SharePad or ShareScope which can level the playing field with the professionals and make it easier for them to identify when shares are undervalued or overvalued. It doesn’t have to be that way. If you are starting out, good quality companies offering a healthy dividend yield of, say, over 4% are a good place to start. You can manage your own money and do a good job. And we are here to help you do it. You can learn more about investing on Phil Oakley’s page.